We tend to do everything we can to avoid suffering and risk. And though we may invest a great deal in protecting ourselves and those we love, we fight a losing battle because we live in a world ruined by sin. We know this but we are still tempted to believe in our own strength and ability to control our lives. So when suffering and grief inevitably come, we are caught off guard. In our confusion, grief can be so severe that we find ourselves unable to even put our experience into words. We can only groan before God and weep. In our passage this morning, the people of Israel are enslaved in Egypt. They suffer for 400 hundred years and they groan because of their slavery. Certainly they pray to Yahweh, but their suffering is such that they cry aloud indiscriminately, pleading that someone—anyone—might save them. And as Israel despairs under their oppression—God remembers, sees, and knows. God remembers His covenant, the commitments that He made to Abraham, Isaac, and Jacob. He remembers His promise to make them into a great nation, to bless them, and to bless all the families of the earth through them. God sees His people. He is the Almighty God of galaxies but His people are always on His heart and mind. He is constantly concerned and at work for their welfare. God not only sees, but He knows their suffering. Jesus is a high priest who sympathizes with His people. Following a particularly difficult season of ministry, I was thankful that God gave me strength to get through it, but I had a lingering fear that He would bring me into something even more challenging and painful for my good. I saw God as helpful, but not very compassionate. Some time later, God spoke to me in prayer. He invited me to acknowledge how hard that season had been for me, and more importantly, He assured me that He was there and that He saw me and understood my pain. If you are going through a difficult season, you are not alone. Your Father remembers His promises to you and He is fulfilling them. Your Father sees you. He has not forgotten you. Your Father knows the depth of your suffering. His heart is filled with compassion for you and He works for your future joy. 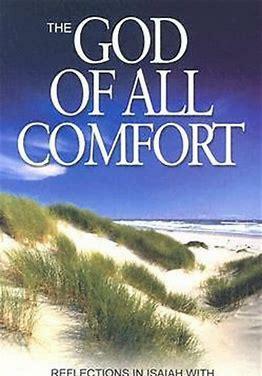 Go quickly to the God of all comfort. Prayer: Father, I thank You that You are more than a dispassionate engineer in my life, worried only about the mechanics and results. You are my Father, who loves me. Give me not only strength, but comfort as well that I may put all my trust in You. Amen.